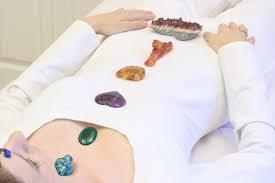 CRYSTAL HEALING is a method of delivering healing vibrations through a laying on the body of gemstones and minerals. Crystals are powerful vibrational healing tools in assisting with your healing process. Crystals have vibrations that can help to heal specific imbalance patterns in the body and aura (energy field). The structure of different crystal formations give the minerals and gemstones their individual ‘personalities’ or vibration. These vibrational patterns are transmitted to our bodies physically and energetically. If used consciously, (such as in programming your intention), they have a powerful healing affect. Crystals work to realign subtle energies and dissolve disease, assisting us to reach the root causes of an issue. Through vibrational resonance, they re-balance the bio magnetic sheath that surrounds and interpenetrates the physical body, and activate linkage points to the chakras which regulate the body’s energy system. Crystal healing is non-invasive and can be safely used to support any physical treatments or medicines you may be using. It is based on uncovering the “who, what, where, when and why”, to bring about immediate healing, using Muscle Testing, or Kinesiology. 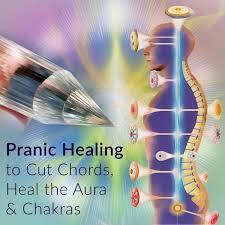 Pranic Healing is an energy-based healing system where the practitioner scans your Chakras to find out where the blockages or holes are, then cleans out and re-energizes the Chakra using breath-work and colour therapy. Pranic Healing accelerates the body’s innate ability to heal itself, and has helped with a large spectrum of physical and psychological conditions, including mental illness, ulcers, back pain, asthma, migraines, multiple sclerosis, cancer, and more. During your session, you will also have the opportunity to receive Pranic Psychology with Sue to talk through whatever issues are being brought up during the healing. Patrick is a Shamanic, holistic healer, who offers specialized services which detox, cleanse and clear, to allow you to experience balancing and activation on all levels of your being. 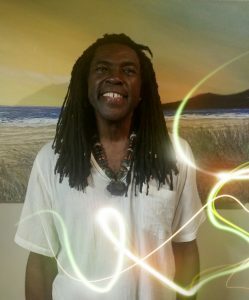 He has worked closely with and learned the knowledge of great and powerful Shamanic healers from many different cultures over the past 20 years, and has applied his knowledge through his healing services at various alternative clinics throughout Australia and New Zealand, including Medicine Wheel in Byron Bay. Become whole again – the way we were intended to be! Liquid Crystals are geometric vibrational remedies made from Earth’s Metals, Minerals and Crystals. These work with our energetic and DNA structures to heal in a profound way. 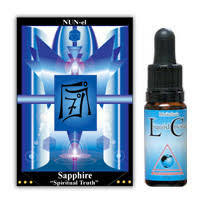 Liquid Crystals are taken orally and are natural, organic and holistic. They will not affect any other medication or treatments, and there are no known side effects. A Human being is made up of Minerals and the Energetic Geometric Structures they contain, so simply integrates the Liquid Crystal’s Geometric structure. This exchange effects the energy and physical bodies, creating an outward expression of Healing. Using your birth date to tap into the Universal Crystalline Cycle, this shows Pete what crystal is influencing you today. Discover your Higher Purpose, Purpose and Shadow Crystals with a Life Purpose reading or go on a deep Journey through the Atlantian cities with a Life Path Reading. The Seven Chakras are the centers in our bodies in which energy flows through. When our Chakras are unbalanced or out of alignment, we can feel overwhelmed and emotional – like life just isn’t ‘working’ for us. The purpose of Chakra balancing is to support a balanced flow that will sustain our overall level of energy – physical, emotional, mental and spiritual. Every day we are subject to a number of stresses and demands that result in fluctuations in our energy level. At The Healing Cottage, we use a Crystal Pendulum to bring your Chakras back into balance. The process is fully guided through from Source Energy, and each balance is individual to your energetic needs in that session. A Chakra Balance can be had as a stand-alone treatment, or as part of a Reiki Healing.